Republican lawmakers in Florida and Texas snubbed the Affordable Care Act’s Medicaid expansion for adults, but their states did broaden the program this year — for school-age children. Those states were among 21 — including some big Democrat-led states, such as California — that were required to widen Medicaid eligibility for children between the ages of 6 and 18 by 2014. That little-known provision of the health law was one factor helping 1.5 million kids gain coverage in the state-federal health insurance program for the poor, according to a survey of a dozen states by Kaiser Health News. While many of those kids were previously enrolled in other public programs, children are typically better off in Medicaid because it offers broader health benefits at lower cost to their families. The higher eligibility level was already in effect for children younger than 6. California led the way, increasing Medicaid enrollment by 715,000 children ages 6 to 18. Five other states — Texas, New York, Florida, Georgia and Colorado — accounted for about 750,000 additional enrollees, according to data measuring growth through this summer. Consumer advocates welcome the expansion of eligibility to children in families making 138% of the federal poverty level, or $32,913 for a family of four — raised from the poverty level, or $23,850 for a family of four. But they say more children would be enrolled had more states expanded the program for adults. That’s because parents who sign up themselves are more likely to sign up their kids. “It’s a lost opportunity for Texas to cover the kids and teens, but not their parents,” said Anne Dunkelberg, associate director of the left-leaning Center for Public Policy Priorities in Austin. While much attention has been paid to the 23 GOP-led states, including Florida and Texas, that have not expanded Medicaid for adults since the Supreme Court made that optional in 2012, there’s been little publicity about the mandatory Medicaid expansion for school-age children. One reason is that the change affected fewer than half the states — those that had not previously raised eligibility levels for school-age kids. The 2010 health law required states to expand by 2014, though California, Colorado and New York started earlier. In addition to those three and Texas and Florida, the other states that broadened eligibility for children are Alabama, Arizona, Arkansas, Delaware, Georgia, Kansas, Mississippi, Nevada, North Carolina, North Dakota, Oregon, Pennsylvania, Tennessee, Utah, West Virginia and Wyoming. Eleven of these states expanding kids’ coverage opted against expanding it for adults, after the Supreme Court gave them that option. In most states, between half and two-thirds of the children joining Medicaid were previously covered by the Children’s Health Insurance Program (CHIP), the federal-state program that helps children in families with incomes too high to qualify for Medicaid but too low to afford insurance on their own. But experts say the benefits are generally richer in Medicaid. For instance, families had to pay monthly premiums for their kids’ CHIP coverage in six states that expanded Medicaid for children — Georgia, Alabama, Arizona, Delaware, Florida and Utah — according to Joan Alker, executive director of Georgetown University Center for Children and Families. “Having (to pay) premiums depresses enrollment” in CHIP, she said. Medicaid requires that children receive comprehensive services, including physical exams, immunizations, laboratory tests, and dental, vision, and hearing services. CHIP benefits are not as broad in all states. Still, state officials and advocates in California and Pennsylvania worry that families may have to find new doctors for their kids because Medicaid does not have as many participating providers as CHIP in some places. “It’s a mixed bag as Medicaid has lower costs but possibly fewer providers,” said Kelly Hardy, senior director of health policy for the California advocacy group Children Now. Nonetheless, Hardy said the expansion makes life easier for parents who will no longer have to deal with having one child in CHIP and another in Medicaid because income eligibility used to vary by age. Siblings in different programs might have different benefits, provider networks and cost-sharing. Unlike Medicaid expansion for adults, the federal government is not paying the full cost of expanded eligibility for the first three years. Instead, states will get the higher federal matching rate for CHIP — about 71% of the costs. In Texas, nearly 2.9 million children were signed up for Medicaid as of August 2014 — up almost 300,000 from December 2013. School-age children made up most of the increase. In the same period, Texas’ CHIP enrollment fell by nearly 160,000 to about 406,000. “There is no doubt we are seeing a welcome mat effect” involving children who were previously eligible but not enrolled, and who were signed up because of the publicity about the ACA’s open enrollment, said Dunkelberg of the Center for Public Policy Priorities. In Florida, enrollment of school-age children in Medicaid rose by 137,000 this year, which included more than 62,000 kids who transferred from the state’s CHIP program, according to Florida Healthy Kids Corp., the nonprofit that runs CHIP in the state. That switch saved families money, since they previously had to pay a $15- or $20-a-month premium in CHIP. In Georgia, meanwhile, Medicaid enrollment for school-age kids rose by 81,000 to about 632,000 since last December. At the same time, the state’s CHIP enrollment fell by about 25,000. Georgia Medicaid Director Jerry Dubberly said the state did little to publicize the expansion for children. He attributes the higher enrollment to that eligibility change, along with a reduction in the number of dropouts as a result of the need to renew coverage for children only once a year under the health law. Pennsylvania officials won federal approval to delay shifting children from CHIP to Medicaid until the end of the year because of concerns that families would have to find new doctors. About 32,000 children in CHIP qualify for Medicaid in Pennsylvania. Even so, the number of Medicaid-enrolled children older than six in Pennsylvania rose by about 18,000 this year to 668,000, which could include children who were uninsured or who switched from private insurance. Officials in Florida, Georgia and Texas discount concerns about the availability of providers. Greg Mellowe, policy director of the consumer group Florida CHAIN, said he hopes the expansion of Medicaid to tens of thousands of children doesn’t go unnoticed by state lawmakers. Push Florida to Expand Medicaid! Even with the passage of the Affordable Care Act (ACA), many residents in the state of Florida are still not getting medical coverage. In fact, when the Supreme Court ruled in favor of the ACA, they deemed it unconstitutional for mandatory expansion of Medicaid in each state. This loophole in the ACA created a gap that could leave nearly 1 million Floridians too poor to afford health insurance through the ACA created exchanges, but also making too much to qualify for Medicaid. Without expanding Medicaid, the program will not extend to cover the people who fall into this gap. This is wrong, immoral, and just plain fiscally irresponsible. The federal government would pick up 100% cost of expanded Medicaid in states for the next three years, and 90% after that. In Florida, rather than accept this money from the national government, our state government is seeking to use federal funds to channel money into private insurance for people whom Medicaid would normally cover. However, doing so is almost 50% more expensive and, as a result, more ineffective than simply expanding Medicaid. What complicates the problem further is that most public hospitals and health clinics had their funding cut for uncompensated care because the ACA assumed most people would now fall under the insurance exchanges. However, with a failure to expand Medicaid, these individuals without insurance will more and more turn to public health facilities who have even fewer resources to care for them. Our goal is to ultimately achieve a single-payer health care system in the United States. We want a system that provides quality health care for every citizen and recognizes health care as a human right. Reaching out to other organizations, being active and tackling problems on the way towards single-payer is how we will achieve that goal. Expanding Medicaid in Florida is one such step towards universal health care and will help nearly 1 million Floridians gain coverage. It’s irresponsible and unjust for our state government to leave so many people out in the cold, and it perfectly reflects the current state of our society not viewing health care as a human right. Florida has the second-highest percentage of residents without health insurance in the US: 24.8% of residents younger than 65 (3.8 million people). Expanding Medicaid could provide coverage for nearly 1 million Floridians. Implementing private insurance is 50% more expensive than expanding Medicaid. Just Health Care is finding organizations in Gainesville and across Florida who will help to pressure the state government to accept federal funds for public Medicaid. Just Health Care is reaching out to other like-minded organizations here in Gainesville and across the state. We want to build a broad network of groups based around this issue. If you’re in an organization you think might be interested in getting involved, or you yourself want to get involved, come out to Just Health Care meetings and volunteer! Similarly, you can speak to people you know in these organizations and find out if their group might be interested in working with Just Health Care to expand Medicaid in the state of Florida! Just Health Care meets monlthy, generally on the second Tuesday of every month at 7 PM in Downtown Gainesville at 14 E. University Ave., #204. For more information, call (352) 375-2832. For those going to the German event this Thursday, please plan ahead of time if you intend to park in UF campus parking. 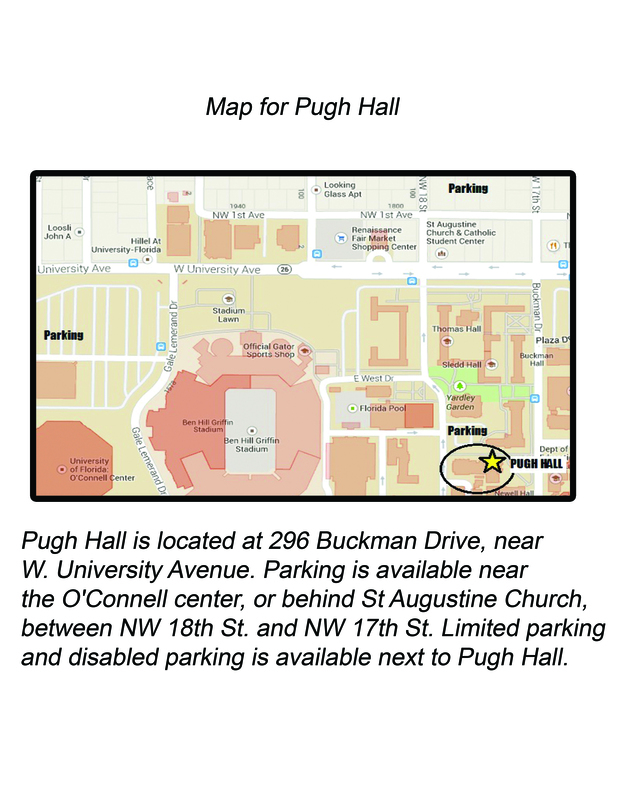 There are limited spaces handicap and disabled parking available next to the Pugh Hall building. Free parking is available next to the Stephen C. O’ Connell Center off of Gale Lemerand Drive and University Avenue. Click here if you would like to see a UF parking map. Paid parking is also available behind the St. Augustine Church across University Avenue, next to NW 18th Street. **To make an arrangement for parking assistance or accommodations please contact Marie Dino at 239-878-6799. Just Health Care will be holding a symposium called “Health Care Around the World: the German System.” In this event, led by Garrett Quinlivan and Chad Hood, we will be discussing the merits of the German health care system versus the American one. There will be a presentation comparing the two health care systems, which will be followed by an open discussion and a choice sampling of German cuisine. The event location is still being determined, but the event is free and open to the public. Be sure to attend this informative and tasty event! We will be discussing our upcoming “Health Care Around the World: The German Experience” event in October. Come and help us do outreach and plan for this informative and exciting event! Join Labor Party Members assemble and prepare the Fall Quarterly Newsletter. This presentation, led by Chad Hood and Garrett Quinlivan, compares the health care systems of Germany and the United States. The presentation will be followed by a Q&A discussion and a choice sampling of German food. The Festival, co-sponsored by the City of Gainesville Department of Cultural Affairs, will have dozens of local musical acts and vendors lining the plaza from 1 to 9pm. A “Kids Space” will also be available. The event is free and open to the public. Come out and table with the Labor Party! Want to see an event hosted by Alachua County Labor Party? Contact Marie or Robbey at aclp@floridalaborparty.org or call 352-378-2832. Dates and events will be updated whenever more information comes in! Hope you had a relaxing weekend. Let’s get geared up for this month and fall. Here are the dates, times, and places for upcoming Labor Party and Just Health Care meetings and events. Just Health Care August meeting at the Labor Party office, located at 14 E. University Avenue, Suite #204. We will be planning for upcoming events like “Health Care Around the World” for the fall, Labor Daze, the trip to visit Congresswomen Corinne Brown, and the Health Care-NOW Strategy Conference in October. August Newsletter Assembly Party at the Labor Party office. 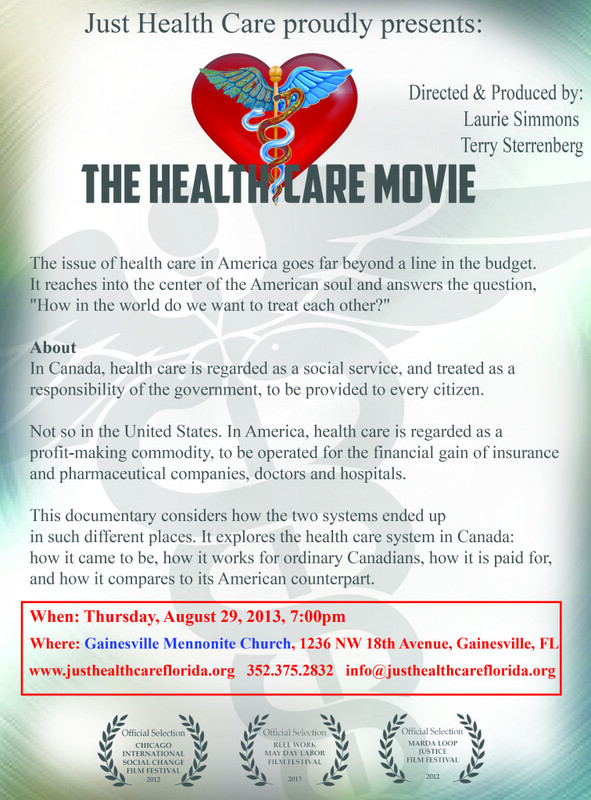 The Healthcare Movie screening at the Gainesville Mennonite Church, located at 1236 NW 18th Avenue. This documentary explores the health care system in Canada: how it came to be, how it works for ordinary Canadians, how it is paid for, and how it compares to its American counterpart. We will have a reflection afterwards and discuss how we can improve our health care system. Labor Daze Festival at the Bo Diddley Plaza, located at Downtown Gainesville. Join Alachua County Labor Party and Just Health Care at the 2013 Labor Daze Festival. This event (and day off, hence “Labor Day”) is dedicated to the hard working laborers who make our city, state, and country run on a day to day basis. Enjoy the festivities with music, activities, literature and fun for the family. Want to see an event hosted by Just Health Care? Contact Marie at info@justhealthcareflorida.org or call 352-378-2832. And don’t worry, more events will be added on as soon as dates are bookmarked. 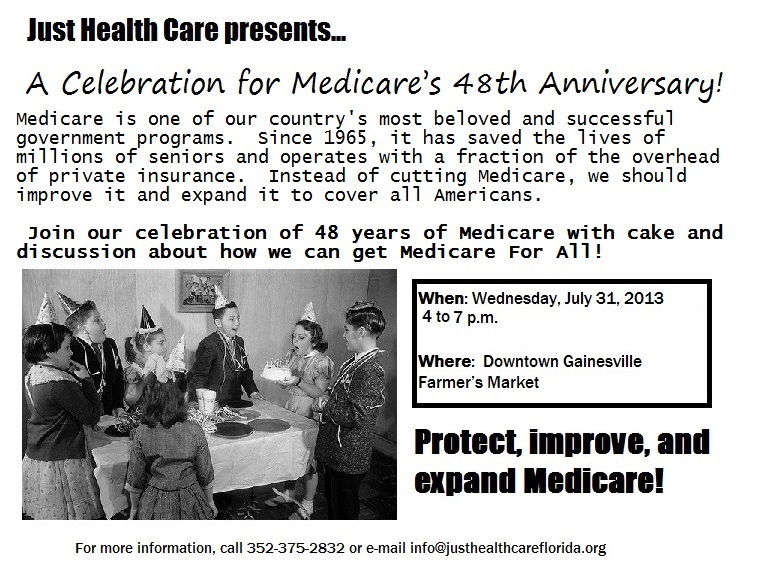 Celebrate Medicare’s 48th Anniversary on July 31st!